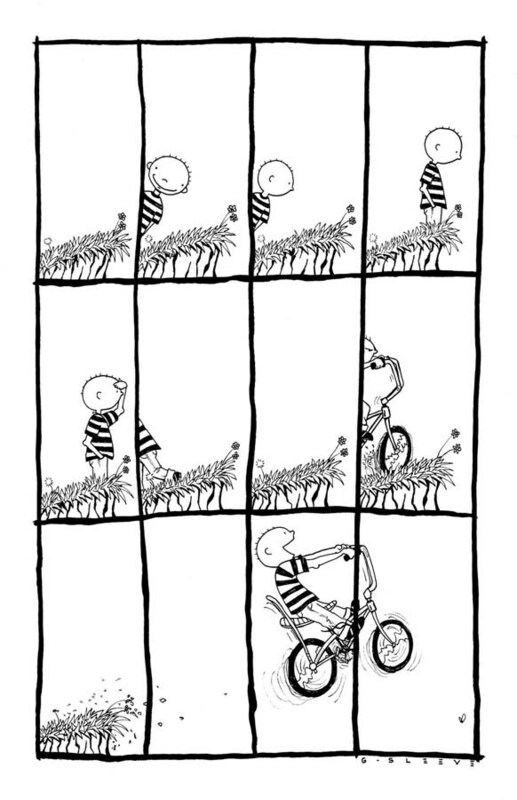 Home > G-sleeve Art > "Being a Kid" Prints by David > "Bike Jump"
The "Bike Jump" print is one of nearly 100 vignettes drawn from the boyhood experiences of the artist, David Gildersleeve. This book is based on "actual" events. Click image to enlarge. How many of us in our younger years ever thought about taking a flying leap on our bikes just for the thrill of soaring into the far reaches of space. Of course, most of us have not given in to such urges, but David expresses that excitement in this illustration from his “Being a Kid” collection. What boy wouldn’t recognize this reflection of his own thoughts so visibly expressed – every glance at that boy soaring off the precipice gives us all a chuckle and a secret thought of “what if….”. I think that kid needs life insurance! This print (11" x 17") is foam-core backed and suitable for framing, and is perfect for hanging in a boy's room. What boy wouldn't be excited to have this reflection of his own thoughts so visibly expressed – every glance at the boy soaring off the precipice gives us all a chuckle and a secret thought of "what if….". We can't help but think that – "I could be that boy!"